Our backyards are home to a myriad of wild animals. However, most of us are familiar with only a small fraction of the amazingly diverse animals that live just outside our backdoor. For example, most homeowners do not realize their yard is inhabited by moles until they see a molehill in their lawn. Many of us were introduced to the mole in Kenneth Grahame's popular children's novel “The Wind in the Willows.” The book describes the adventures of Mole and his cohorts Rat, Badger and Toad as they travel across England's Thames Valley. During the past century these stories were read by millions around the world. While we all realize that the book’s Mole shares little in common with a real mole, have you ever stopped to wonder what a mole is really like? The only two species of moles known to live in Georgia are the star-nosed and eastern. The eastern mole ranges across the entire state. 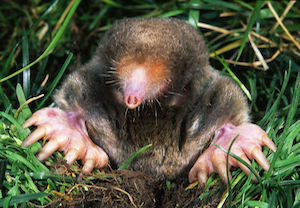 The star-nosed mole's range in Georgia is limited to the northeast corner of the state. Adult eastern moles are about 5 to 7 inches long and weigh only 3 to 5 ounces. Females, or sows, are smaller than males, which are called boars. The eastern mole's coat is grayish brown. The underparts tend to be lighter or browner than the rest of the body. A mole’s hair is extremely fine and can lie either forward or back. Consequently, the hair offers little resistance as the animal scurries forward or backward in its tunnels. Mole fur is so soft that England's Queen Alexandra, the wife of Edward VII, had a mole-fur coat made for herself. The unusual garment was tailored from hundreds of tiny mole pelts sewn together. A mole’s tail, feet and face are pink. The eastern mole's back feet are much smaller than its front feet. The front paws feature long claws that enable creature to dig through the soil. If you closely examine a mole, you will find that you cannot see the animal's eyes. This is because its eyelids are fused. Mammologists believe the eastern mole's eyes can only discern light and dark. Although it appears that eastern moles have excellent hearing, they do not have external ears. Instead, the tiny ear openings are hidden beneath the animal's dense fur. The eastern mole's snout is festooned with small bumps. These tiny sensory organs help the animal detect both the scent and movement of potential prey. Another one of the eastern mole's amazing adaptations for life underground is its ability to tolerate higher levels of carbon dioxide than other mammals. Their red blood cells contain a type of hemoglobin that can carry more oxygen. Amazingly, moles also can reuse the air they exhale. Eastern moles live in a variety of habitats, including fields, open woods and yards. They have a difficult time trying to dig in dry, clay soils such as are found throughout much of the northern half of Georgia. They also try to avoid wet soils. Instead, they prefer to make their home in well-drained, loose soil. The only moles most of us ever see are those caught by house cats and dogs. One reason for this is the eastern mole spends 99 percent of its time in underground burrows. During their rare forays above ground, they are easy prey for foxes, owls, hawks, dogs, cats and other predators. The deeper tunnels are called permanent burrows. These range from nearly 6 to just over 23 inches below the surface. They include the mole's living quarters. Moles also retreat to the deep tunnels to escape extremely hot and cold weather. The eastern mole is an accomplished excavator. In soft soil, it can dig new burrows at the rate of 18 feet an hour. When digging, moles push excess soil up vertical tunnels. This forms piles of dirt commonly called molehills. Eastern moles do not hibernate and are active both day and night. They are busiest late and early in the day. Moles will remain active for about six and-a-half hours followed by three hours of rest. A male’s home range averages 2.7 acres; a female’s, only about seventh-tenths of an acre. The mole lives a solitary life. In fact, the only time many moles encounter one another is during the mating season, which occurs during late winter and early spring. The females give birth to two to five young in a subterranean nest lined with leaves and grasses some 5 to 18 inches below ground. Nests are often beneath clumps of grass, shrubs or rocks. The young leave the nest at about 4 weeks old. Moles can live more than 6 years. Moles are voracious eaters, consuming 25–40 percent or more of their weight in food each day. It has been reported that a mole will die when deprived of food for 12 hours. Their favorite food, by far, is earthworms; however, they will also gobble up centipedes, spiders, beetles, ant pupae, snails, slugs and seeds, as well as the larvae of insects such as Japanese beetles. One researcher found that moles can consume 140 grubs and earthworms a day. In another instance, moles were credited with controlling an infestation of Japanese beetles. All told, a mole can eat 50 pounds of food each year. Many homeowners consider moles nuisances since they mar their manicured lawns with molehills, and are often blamed for undermining ornamental plants. However, this is not the case is some parts of the world. In Germany, for example, moles are protected by law and can only be destroyed when a landowner is issued a mole control permit. On the other side of the coin, moles help in aerating the soil and controlling insect pests. President Theodore Roosevelt so admired Mole and the other characters in “The Wind in The Willows” that he wrote to the author explaining that he "read and reread it, and have come to accept the characters as old friends." Although most of us will probably never consider moles old friends, we should at least admire how well they are adapted to their solitary life underground, and even find a way to coexist with these remarkable mammals.